Repair your treasure! 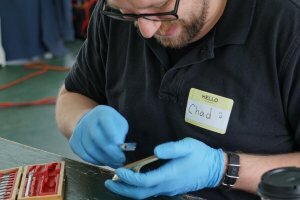 Guests can bring a damaged household item or family heirloom to the Repair Cafe, where community volunteers will pass on their fix-it skills free of charge. This eco-friendly event encourages frugality, ingenuity, and the appreciation of everyday objects. No need to register. Participants will be assisted with one item on a first come, first-served basis. If you would like to volunteer to share your repair skills at this event, please contact Karen Thompson at DFLPrograms@gmail.com or by phone at the Desmond Fish Library, 845-424-3020.